On retiring from Formula 1 as a racing driver at the end of the 2006 season, Michael was retained in the role of consultant by Ferrari. Michael’s role is to lend his experience to help in many areas, including with race and road car development and advising the F1 team. The role also involves attending some races. Other key names also changed positions in Ferrari when Schuey retired as an F1 driver. Technical Director Ross Brawn took a sabbatical and later joined the Honda team as Team Principal. Team Principal Jean Todt saw out one more season and then moved up the ladder to become CEO of Ferrari (a position he then resigned in March 08). In 2003 Michael retained his title as World Champion for the fourth year in a row! Once again car number one belonged to the number one. At Suzuka on 12 October 2003, Michael clinched his sixth world championship title. It took a long time to achieve the fourth in 2000, but since then he has taken four in a row. Michael threby surpassed Senna’s (3), Prost’s (4) and Fangio’s (5) number of titles. He finished eighth at Suzuka to put himself 2 points clear of Finn, Raikkonen, who finished second. To take the title Raikkonen would have had to finish second with Michael ninth or lower. Michael came back with a vengeance in the 2000 season! After taking pole in Italy he led the race from Hakkinen until the finish. This closed him to within two points of Hakkinen in the Championship points table. Michael was elated after the race win. In an emotional moment he broke into tears during the press conference, when asked about how he felt about matching Senna’s career win record. A serious accident at the start of the race required the safety car to come out and a marshal was sadly killed by a flying wheel. On an amusing sidenote Jenson Button attempted to blame Michael for what was a faux pas on his part. As the field backed up when the safety car went in, he careered off down some grass – the inexperienced driver said Michael shouldn’t have slowed the pack down! It seemed that a significant majority weren’t too keen on Schuey’s role as a shampoo salesman. Someone else obviously agreed, as the ads only ran for a short time before being pulled from TV! The Times reported that Schuey had demanded his real voice be reinstated on the advert, replacing the one with the dubbed false German accent. In 1991, a new talent burst onto the F1 scene at Spa. Michael Schumacher qualified 7th in his Jordan, but suffered clutch failure when leaving the line. However, he had been noticed by Benetton boss Flavio Briatore and Schumacher took Roberto Moreno’s place in that team at the following race at Monza. Briatore and Schumacher were a powerful combination, with Ross Brawn, the then Benetton technical director. 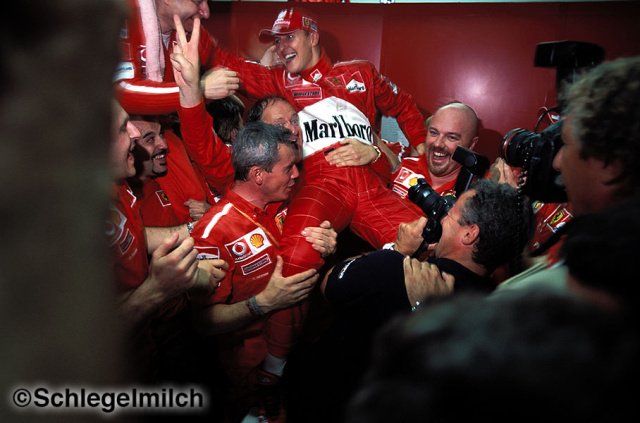 The following year, in 1992, Schumi scored his first win. A brilliantly judged performance at Spa, beating the might of the far superior Williams’ cars of Mansell and Patrese. In 1994, Schumi was given a potentially championship winning car, the Benetton B194, designed by Rory Byrne. Ayrton Senna was gunning for the championship himself, having recently joined Williams. Tragically however, Senna was killed at Imola and Schumi took over the reigns as the top driver in F1. He won the first four races of the 1994 season and was pulling away from his rivals in the standings, when he was disqualified from the British GP for overtaking Hill on the warm-up lap (a regulation now retracted). He was also disqualified from the Belgian GP because the undertray of the Benetton was deemed illegal. Hill gained much needed points and closed up on Schumacher in the championship – whilst Schumi was forced to sit out 2 Grands Prix. His greatest win of the year was at Monaco, in the most difficult circumstances. There, Schumi won by nearly a minute from Brundle (his former team-mate who was then in a McLaren). The other stand out performance of 1994 was in Spain. Schumi was stuck in 5th gear for more than 40 laps, and still he finished second only to Hill. Eventually, however, Schumi won his first F1 championship after a controversial collision with Hill at Adelaide in Australia. In 1995, Schumi was given a car that was equal to the Williams. The Benetton B195 was powered by a Renault engine, the same power-plant used in the Williams. Schumi won the first race of the season in Brazil, but was initially disqualified on fuel irregularities, then later reinstated on appeal. The next two races, Argentina and San Marino were both won by Damon Hill. Schumi made a mistake on a slippery surface at Imola and crashed – an uncharacteristic mistake but as he said himself “I am allowed one mistake a season”. He returned to form with a dominant performance at Monaco. As the season unfolded, Hill and the Williams team became increasingly desperate. Hill and Schumi had several collisions, starting at the British GP, when Hill made a wildly optimistic move, and took them both out. 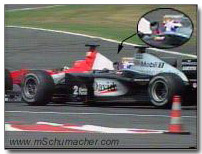 Hill also made several silly mistakes, allowing Schumi to pull well clear of him in the race for the title. 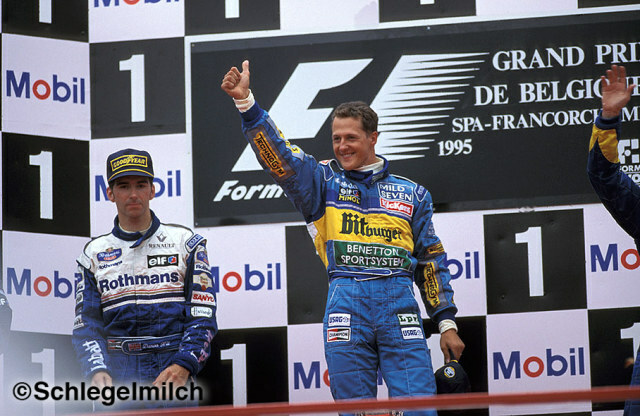 Hill and Schumacher had a fabulous battle at Belgium. As is often the case at Spa, it was a wet race, and this time Schumi had not qualified well. He gambled on starting on slick tyres to gain advantage in the early laps, which was successful. The rain however became heavier, and Hill who was on rain tyres was closing on Schumi. For a lap and a half, the two were often side-by-side, until Schumi slid wide on a puddle, letting Hill pass. Schumacher then went into the pits after an accident brought out the safety car, and changed to rain tyres. Hill subsequently spun and fell away, but recovered to finish second behind Schumi. Schumi had the championship wrapped up with 2 races to go. For 1996, as two times world champion, Schumi was offered a drive with Ferrari – partnered with Eddie Irvine. The F310 was the first Ferrari to have a V10 engine, so reliability was a problem in the early part of the year. Also, the F310 had an innovative titanium gearbox, which reportedly cost the same to research and develop as the Minardi team’s budget for a whole season! Schumacher won 3 races on the way to third place in the title race, including a superb win in terrible conditions in Spain. In 1997, Schumacher and Jacques Villeneuve were fighting for the championship. Schumacher had scored 5 wins including his greatest performance at a wet Monaco circuit. In a race where less than half the field finished, Schumi was nearly a lap ahead of the pack, including his fast-improving team-mate, Irvine. 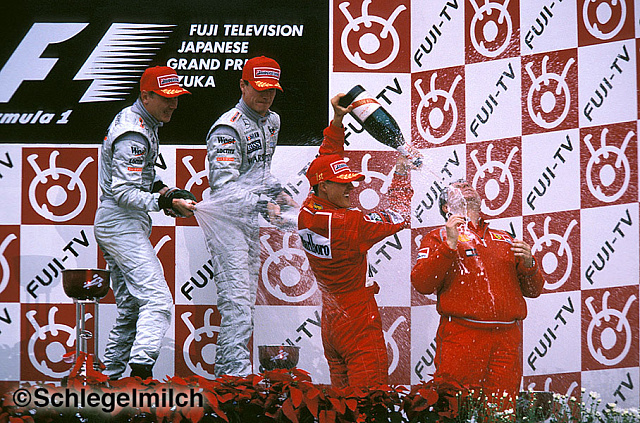 At Suzuka in Japan, Schumi and Irvine beat Williams hands-down with a superb tactical performance. Villeneuve had been disqualified from the race for not slowing down for a yellow flag – but was later reinstated. Ferrari believed Villeneuve would probably then have any points docked, so Schumi risked being punted off the track. Irvine was instructed to get past Villeneuve, hold him up, and let Schumacher win, and that is exactly what he did. Not for the first time, Ross Brawn (who was asked to go to Ferrari with Schumi and Rory Byrne) and Schumi had made another team look tactically naive. At the final race of the season at Jerez, Schumi’s car developed technical problems and was slowing, with Villeneuve fast closing to take the lead. Villeneuve tried to pass, but Schumi was closing the door. 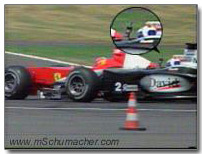 If he had moved to cover his line a second earlier, he would have forced Villeneuve to back off, but as it was, there was a collision, and Schumacher was out. Villeneuve continued on and became world champion – and Schumacher had to wait another year for a chance at the title. Schumi was looking great in 1998. Six wins had put him into contention for the title. He had a controversial collision with Coulthard in Argentina – but Michael is a hard racer and we know what to expect in races. 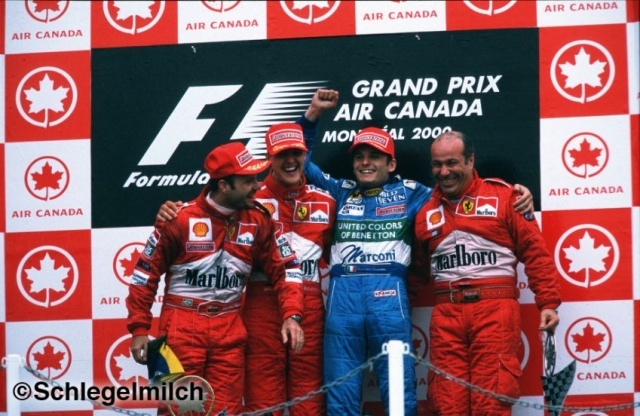 Schumi scored a stunning hat-trick in Canada, France and Britain – where he won on the wrong side of the pit wall at Silverstone (the first time this had ever happened)! He had passed Wurz under yellow flags, but the stewards didn’t pass the message to Ferrari until there were 3 laps left. Ross Brawn instructed Schumi to come in on the last lap, to take his 10 second stop and go penalty. It was the most bizarre ends to a race in living memory. In Hungary, Schumi outfoxed all the opposition with a 3 pit-stop strategy, which enabled him to take an astounding victory. 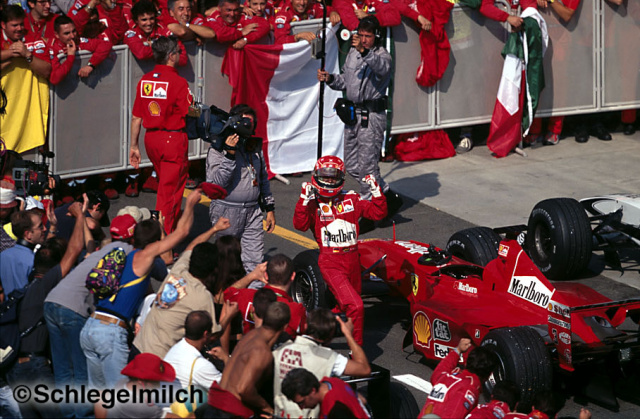 At Monza Schumi scored a very popular home win for Ferrari, with Irvine coming in second. 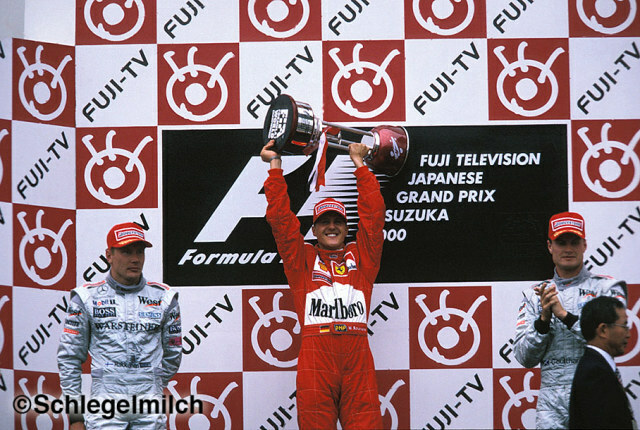 In Japan, Schumi could have won his third title, but he stalled on pole position (officially due to a faulty device in the clutch mechanism). As a result, he finished second in the Championship again. In 1999, Ferrari seemed to have got everything right and it seemed as if Michael might finally regain the title. 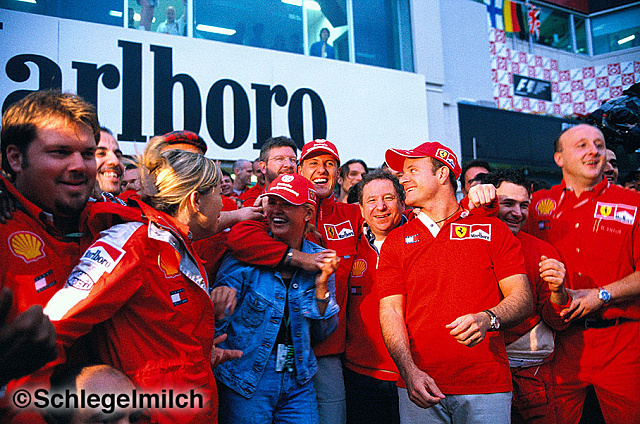 Irvine achieved his first victory, in Australia – followed by brilliant Schumi wins at Imola and Monaco. Then came the fateful British GP, where Michael’s brakes failed on the first lap, and he smashed into the wall at Stowe breaking his right leg badly. Irvine and stand-in driver Mika Salo battled against McLaren, scoring two wins and some podiums, until Michael (some say reluctantly) returned, at the now legendary first Malaysian GP. Schumi dominated the event, taking pole by nearly a second, and holding off Hakkinen throughout the event. Ultimately however, it was Hakkinen who ended up champion for the second time.